Reassembler - Emulation & Decompilation: OutRun Easter Egg - The Definite Guide! As always an excellent read. As far as I know, Sega did not believe in giving people proper credit on games. So everyone back then used nicknames or their initials they had around the office. 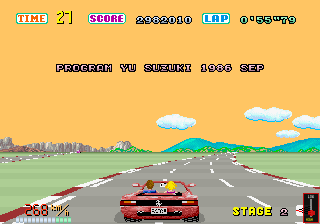 Everyone who worked for Sega at this time that I contacted have said that this was because it was their game making policy back then (along with, "making sure the title screen has "PRESS START BUTTON" indications, a pause message for indicating pauses, etc). Even though the actual reason isn't clear, it might be because that they were just trying to protect the identities of their most valued employees so that other companies wouldn't be able to hire them (I think this is mostly false, but it can be true for some cases). Since the game was developed at R/D1 (I think), they must've had some nice engineers working there. Another thing that I discovered while doing some research, was that a majority of the people who are still employed at Sega who have worked as a programmer or even a simple manager from the time of the System 16 games have gone up in rank within the company as R/D specialists, etc. Since there was a button code involved to get the message to show up, this reminds me of Sonic the Hedgehog - another nice example as to how Sega worked back then. As far as I know, the American release of Sonic 1 doesn't have the hidden Easter Egg which revealed the developer's real names. However the Japanese version has this really complicated button cheat that you probably wouldn't be able to guess by yourself in order for the easter egg to show up. 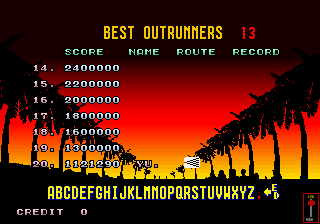 I'm not sure which revision was for which country for Outrun, but my guess is that the one with the easiest method to unlock the Easter Egg was based in Japan. The revision where it got harder was probably for America/World, right? If that's the case, Yu probably had to follow SoA's policies and had to make the easter egg harder to access. 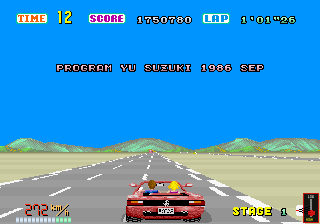 It would be good to compile a definite list of the OutRun team. The high score table provides some hints (via their initials). I wonder who the full team was? "I've even disassembled some rather dull code relating to the coin chutes." Just checking... that was for credit, rather than any payout (SWP) capability?